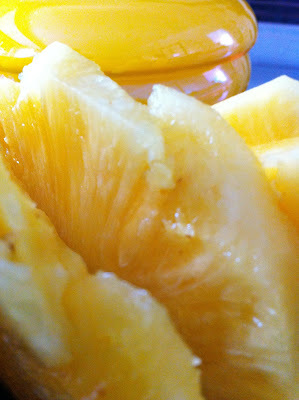 What could be more refreshing than ripe sweet and chilled fresh pineapple slices? When looking for some ideas to post over Christmas this one "Acar Timun Nenas" popped out! On our last visit to Malaysia we had it a lot and thought it would be a great recipe to serve at home particularly during this season as it would be a fantastic condiment for all those Christmas cold meats or indeed that turkey curry! Its an easy but unusual pineapple and cucumber salad which removes pineapple from its usual fruit companions and launches it into the world of savoury dishes - a kind of "trompe l'oeil" for the palate! Acar (pronounced Achar) Timun Nanas is such a popular sweet sour salad it is served as an accompaniment to almost everything. It is a terrific counter balance that cuts through the heat and spices of the many Malaysian curry dishes or the Malay national dish of beef rendang and adds a uniquely fresh and tangy note which would also be ideal with grilled or roast meats or barbecues. Dissolve sugar and salt in vinegar and add cucumber pineapple chilli and coriander. Toss to mix. Re-fridgerate until ready to serve. Just before serving garnish with a sprinkling of crushed roasted peanuts.